Neil Gaiman is a writer of excellent and discriminating taste. He likes rats. Most of his books have at least one rat in them. I am presently reading his latest collection of short stories, "Trigger Warnings". I haven't encountered any rats yet, but I fully expect I will. Which brings me to this image. 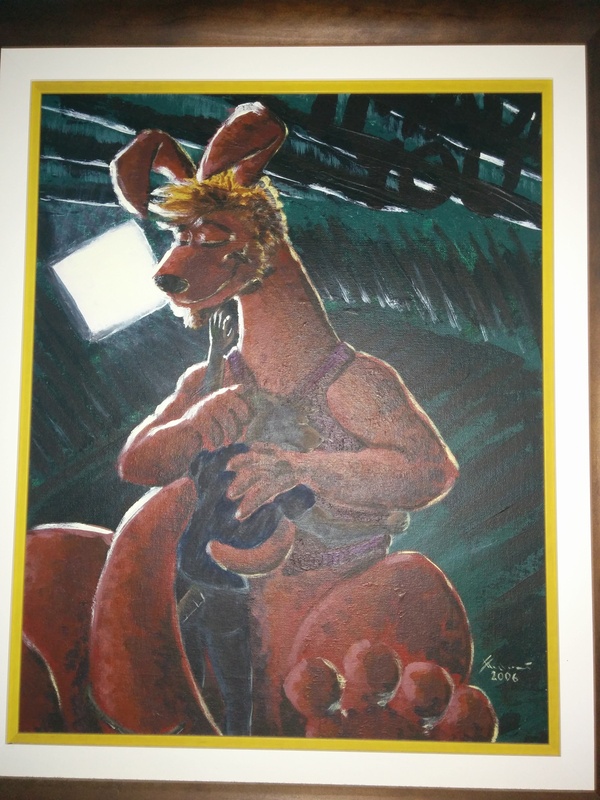 I won it in the art auction at Further Confusion 2007. I just had to get it because I am a rat that loves kangaroos. I asked the artist, G T Skunkrat, for the story behind this piece and he said there wasn't any. It's a fine piece, but that's where he fell down, according to Neil Gaiman, who had this choice piece of advice for artists: "Be amiable but enigmatic, and when people ask for the story behind the painting, say, "My lips are sealed." But for god's sake, imply there is one. It's the story they're buying." Of course, I'd already bought it by then so it didn't matter, and I still have it celebrate my longstanding love of kangaroos. I actually know GT Skunkrat. Never saw this image. Is nice.